Oh my goodness - Da Nelly was here, in the fur!!! That was pretty darn amazing, they are gorgeous! That sure was an up close and personal view of the elk herd. OME(lks) they have the most precious little beige bums almost heart shaped. Shyla was checking out the herd of elk. She's a smart one. And the last stag? ( or are the called bulls up North) turned to face the camera, what a herd and stunning video. And so close to your home, I truly cannot imagine having them at your back door. Thanks for sharing, another view into your part of the world, so true, we were right there with them. And as they trod through the top snow layer, almost as if they limped for one step, guess it was soft and fairly deep. Maybe the word got out that there was grass over there.....no....over there...no back that way. What a treat to see them so close. 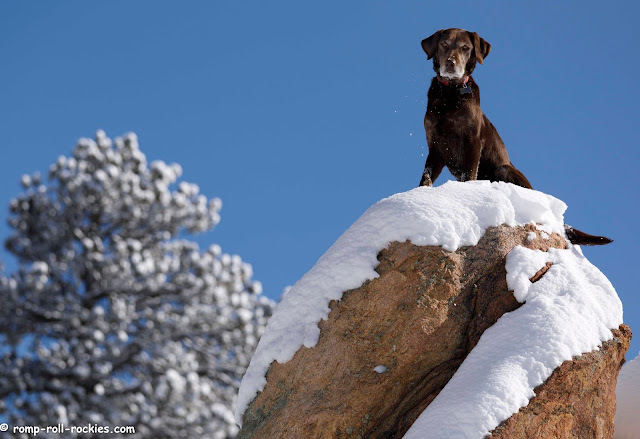 We'd be worried about mountain lions being close, too. That would sure excite me! You definitely live in a wonderful place. I could never experience something like that here; I already get excited when I see a fox in my garden and hear a coyote in the night. They are so graceful and beautiful and we can almost reach out and touch them! What a wonderful video, KB! We always enjoy seeing the elk also, but we love seeing your video. It really does make me feel like I am standing in the middle of the herd!! That is really fun! It would be weird to go outside and into a herd, though. Do you have to keep the dogs in when the herd is so close? The dogs are actually pretty respectful of the herd. Each animal is huge. Then, there are as many as 200 of them together. It makes a dog think twice about going near them!! 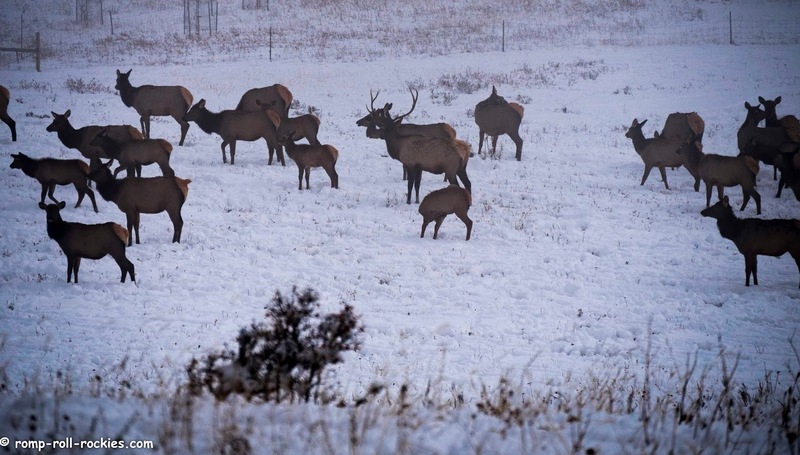 People do get stuck in their homes when either the elk herd or moose are too close. 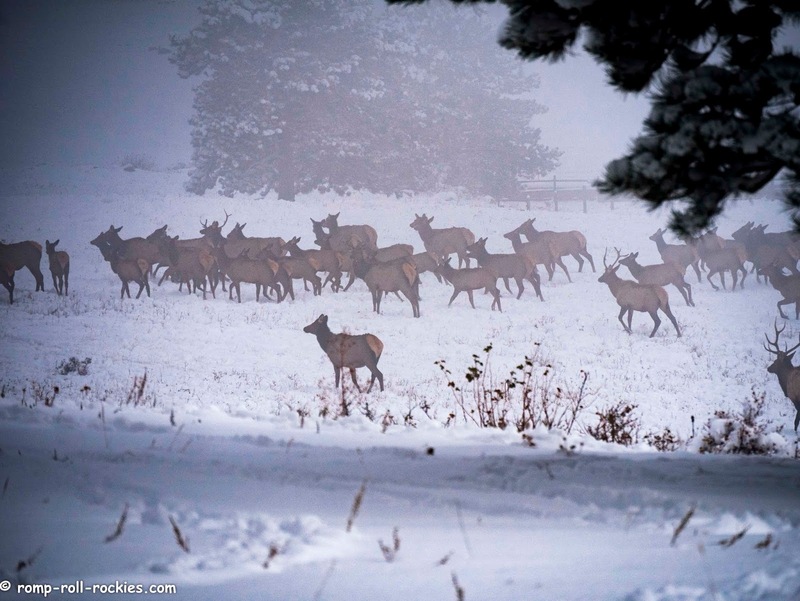 The elk herd would run if someone went out (but who wants to chase them off?) but the moose will charge you (as you know, I'm sure)! No one at all savvy messes with moose. Thanks for sharing such an up-close-and-personal view of the herd. I was surprised that the bulls still carried antlers. Those are from last year's growth, yes? When do they drop them in Colorado? I was also surprised to see bulls of several ages and cows all herding together. Guess I don't know as much about elk biology as I thought! Is that because the rut is past and the calving season hasn't started yet? They are from last year's growth, and they usually drop them in early spring - so around now. Our herd surprises me all the time. 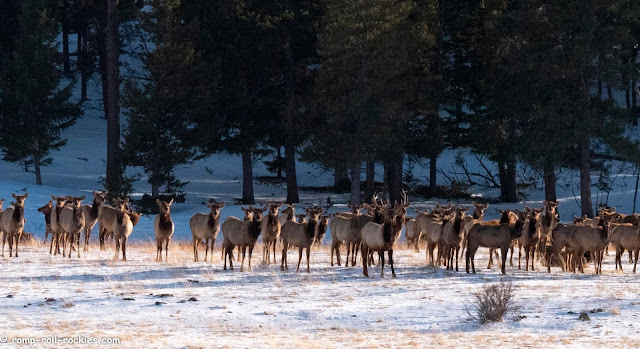 The biggest bulls usually form a small herd of their own (less than 10 bulls) while the younger bulls stay with the big herd of cow elk. I was surprised by the size of the antlers on one bull that is still with the big herd. That's unusual but not unprecedented. I never see our herd during calving season (they go up to around 13,000' in that season) but I've read that the big bulls are not with them then. I do know that the small herd of really big bulls stays at our elevation (in our neighborhood) for most of the summer. Elk TV must be even better than bird TV. It looks awesome. Our deer have also returned over the past few weeks. Spring is coming. Oh wow, that elk herd video is awesome. One wonders why they keep so much fur around their necks? I can almost touch them!!! 200 of them,, WOW!